The Tropospheric Monitoring Instrument TROPOMI will look at Earth from an altitude of 800 km for a period of about seven years. The daily global measurements with high resolution and sensitivity will provide insight into air pollution, greenhouse gases, methane and the ozone hole. Thanks to a seven by seven km resolution pollution can be traced directly to the source. Gathering data about the Earth’s troposphere – the lowest part of our atmosphere – plays a vital role in mankind’s quest to understand climate change. Scientists need to know which gases are present in what quantities, and how these figures change over time. Satellite instrument Tropomi, developed in the Netherlands, investigates air quality more accurately than ever before and provides information for climate studies. Tropomi is the only instrument on board the Sentinel-5 precursor satellite, which is part of the European Earth observation programme Copernicus. The instrument identifies and measures levels of gases by comparing light that has travelled through the atmosphere with light coming directly from the sun. This allows the instrument to map the amounts of gases such as ozone, carbon monoxide and methane in the atmosphere. In addition, Tropomi also monitors the amount of volcanic ash in the air and provides data on UV radiation. The satellite orbits Earth at an altitude of 824 kilometres. From this position, Tropomi maps the entire globe every 24 hours at a resolution of 7 by 7 kilometres. These measurements are detailed enough to detect air pollution at the level of individual cities. Besides, the data allows scientists to create more accurate climate models. Achieving this much accuracy in an instrument no bigger than a small fridge requires a lot of ingenuity. Instead of the usual spherical mirrors, Tropomi uses freeform mirrors. For one of the spectral channels, a silicon “immersed grating” is then used to unravel the light waves into different wavelengths. 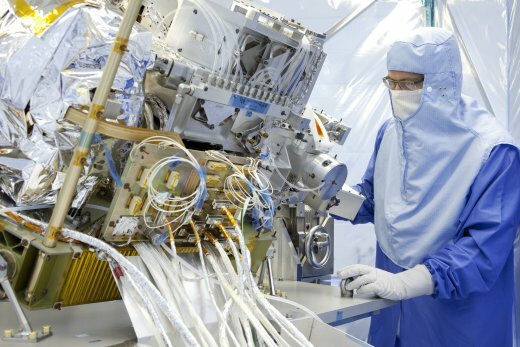 This innovative technology contributed by TNO and SRON, makes it possible to keep Tropomi small while delivering such high-resolution images. As a prime, Airbus Defence and Space Netherlands was in charge of the overall design, the building and testing of Tropomi. Together with KNMI, SRON and TNO we formed the heart of the Tropomi project team, in which dozens of scientists and engineers from various Dutch organisations were involved. Airbus was prime for Sentinel-5 Precursor, with four sites involved in development and manufacturing of the satellite and its components: Stevenage (UK – prime contractor for the satellite), Toulouse (France), Friedrichshafen (Germany) and Leiden (Netherlands – prime contractor for the Tropomi instrument).